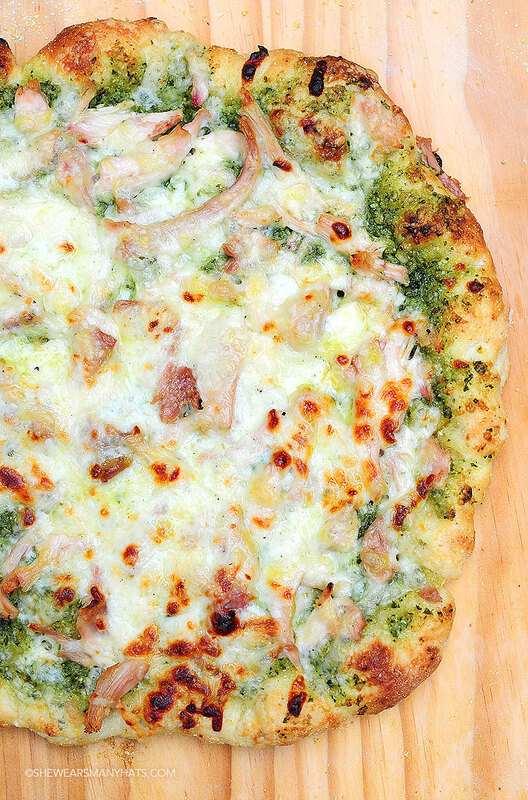 This Pesto Chicken Homemade Pizza will have you whipping up pizza all the time. 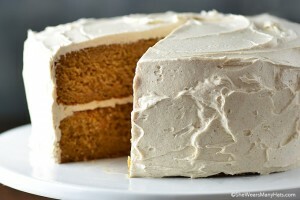 It’s easy and so tasty. You won’t believe how quickly it will disappear right before your eyes. 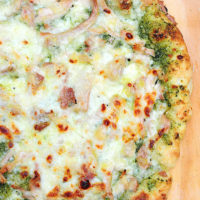 It’s not delivery … or Digiorno’s, it’s Pesto Chicken Homemade Pizza! 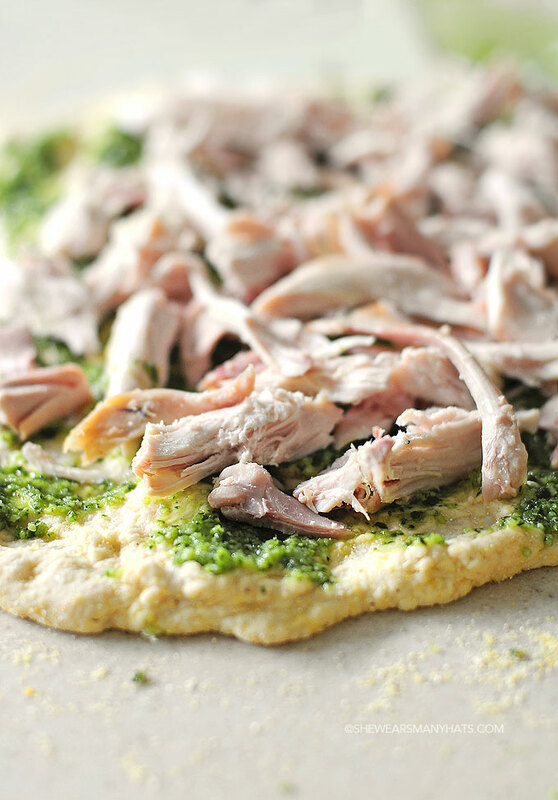 Why order pizza or even choose the freezer aisle when you can make this simple and delicious chicken pesto pizza right at home? 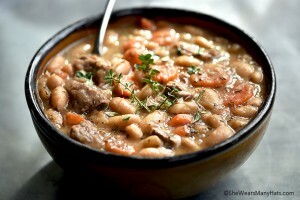 It’s fresh with elements of summertime comfort food that leaves regular greasy pizza in the dust. 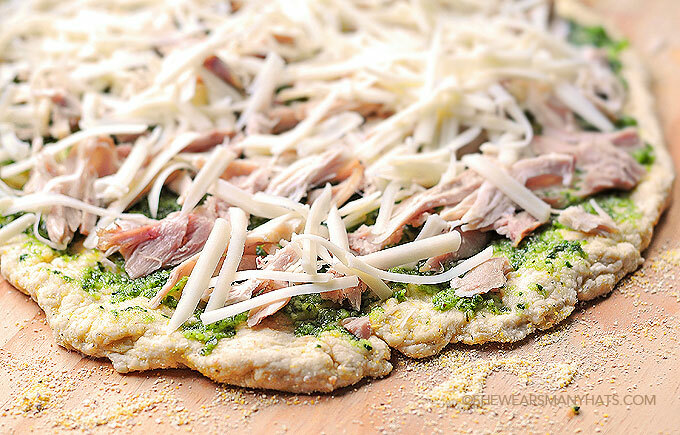 With only 4 quick ingredients, this Pesto Chicken Homemade Pizza will soon become a dinnertime weekly staple. You may even fight over who gets to toss the dough! It’s always a fun family-faovrite meal to make. Everyone gets in on the meal prep action! We like to use a pizza stone and bake the pizzas in our grill. Grilling just makes the crust turn out better and it gives the pie that fantastic wood-fired oven flavor. However, you can also use an oven indoors. Keep in mind that since most ovens will not reach 600-degrees F, you’ll have to increase cook time to compensate for lower cook temperature. If you don’t own a pizza stone, consider purchasing one. It does help the bottom of the crust cook evenly and crisp up better. Plus it’s great for baking Chocolate Chip Cookies on too! As mentioned above, if you prefer to bake the pizzas in an oven indoors, keep in mind that most ovens will not heat to 600-degrees F. In that case, preheat the oven to the highest it will go (as long as it’s not above 600-degrees F), and adjust cook time accordingly. Be watchful so as not to burn pizza. Use your favorite pizza dough recipe or cheat a bit like we do in a crunch for time. Some grocers offer pre-made pizza dough, portioned out, that has not yet been baked. For example, at our local Publix grocery stores we can find it in a small refrigerator that’s located in the bakery section. Preheat grill or oven to 600-degrees F.
Divide pesto between crusts and spread evenly. Repeat with chicken and cheese. Place pizzas on a pizza stone or directly on grate and bake for 600-degrees F for about 8 minutes or until done. If you don't own a pizza stone, consider purchasing one. It does help the bottom of the crust cook evenly and crisp up better. Plus it's great for baking Chocolate Chip Cookies on too! As mentioned above, if you prefer to bake the pizzas in an oven indoors, keep in mind that most ovens will not heat to 600-degrees F. In that case, preheat the oven to the highest it will go (as long as it's not above 600-degrees F), and adjust cook time accordingly. Be watchful so as not to burn pizza. Use your favorite pizza dough recipe or cheat a bit like we do in a crunch for time. Some grocers offer pre-made pizza dough, portioned out, that has not yet been baked. For example, at our local Publix grocery stores we can find it in a small refrigerator that's located in the bakery section. 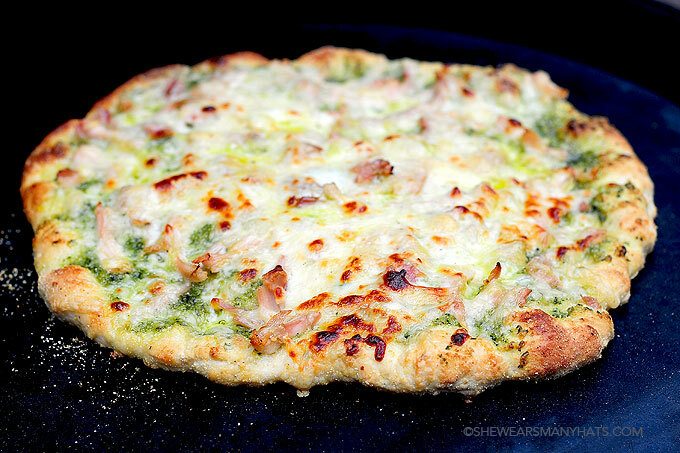 Grilling pizza sounds like a great idea! And pesto pizza makes it that much better! I’m drooling just looking at this amazing pizza! Yum! Every ingredient in this dish sounds amazing. I can only imagine how they taste combined. Sounds and looks yummy! 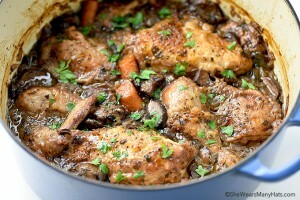 Definitely going to try this recipe soon, thanks for sharing!